Are you tired of putting so much time and energy into another fundraising event? Maybe you’re going to the same donors repeatedly asking for money, and you want to start broadening your reach. Many organizations across the country are jumping on the concept of a “Giving Day.” A Giving Day is a day-long online fundraising effort that unites a community around local causes. It’s an initiative that many non-profit organizations and educational institutions are utilizing to diversify their funding streams. Unlike your typical fundraising in-person event, Giving Days are focused primarily online. There is usually a landing page for giving and then social media outlets are utilized to build hype and engage an audience. It’s more than fundraising: A Giving Day is not just a fundraiser, but it’s an awareness campaign. A Giving Day allows you the opportunity to share your mission, your organization’s story and purpose all day long. It’s more accessible: The advantage of hosting a Giving Day over an event is that people can engage on THEIR time. They don’t have to drive to a certain location or schedule a 2-hour timeslot. They can hop on their social media channels to watch interviews, read testimonials, and choose to give when it’s convenient for them. It broadens your audience: You don’t have to limit yourself to your local community. With an online campaign you can engage EVERYONE! You can reach people across the state, the country or the world through one simple click on their computer. It builds momentum: The task of planning a Giving Day can be daunting during year one. However, this is a campaign you revisit every year. Once you have the plan in motion and start building excitement, each year gets easier. WDM Creative, a public relations and creative firm, wrapped up another successful Giving Day Campaign with the Rehabilitation Hospital of Indianapolis (RHI) on September 22nd. They have created a systematic approach and strategy to tackling Giving Days. They graciously shared some insight on their process. 6 Months for Planning: WDM President Lori Winkler suggests a 6-month timeline to adequately plan your Giving Day. This time leading up to your actual day of giving is a great opportunity to build excitement and start promoting your campaign. Sponsorships & Match Dollars: It’s important to have some dollars planned before the actual Giving Day rolls around. Talk to corporations to partner with you, not just on the day of giving, but during the months leading up to the event! Have conversations with donors who may be willing to offer matches or incentives throughout your full Giving Day to build excitement or competition. Website Platform: It’s important to have a landing page up and running months prior to your Giving Day. Update content regularly as you nail down the schedule of the day or new corporate partners. Then have another page ready for the actual Giving Day where people can start making donations and see the money being raised in real time. Make sure your platform can handle the influx of visitors. Your 24-hour giving period is not the time for technical malfunctions! Social Media: Amp up your social media engagement for months prior to the Giving Day. 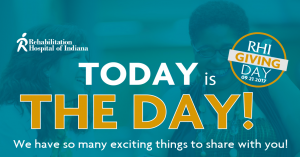 You can create a Facebook Event like WDM did with RHI’s Giving Day. They also utilized Facebook Live and had hourly interviews with a variety of key stakeholders to share their story about the impact of the cause: patients, staff, researchers, donors, etc. Marketing Plan: You’ll want to develop a brand specifically for your Giving Day. Create logos, collateral material, etc. that accurately describes your organization and the goal of your Giving Day. These are all tools you can then reuse every year. Manpower: Whether you’re able to bring on a team like WDM or have a committee of volunteers, understand that you’ll need manpower to plan your day just as you would for an event. Even though your main focus is your online engagement, you may want a hub to generate excitement locally. This hub serves as a place for people to bring in cash donations and/or interviews to take place. If you’re hosting it at your organization, it is a great visual for staff or clients who walk through your doors daily. You may want an Emcee, someone who can shoot video for live Facebook interviews, people monitoring social media platforms and posting updates. At WDM, they have found that Giving Days not only lead to new donors, but also elevates current donors’ giving. It’s a great strategy for an organization who is willing to think outside the box to accelerate impact. If you’re looking for new strategies to fundraise, contact us today and we’d love to chat about our services! Is it Time to Redesign Your Program?